I guess I’m still pretty bad at keeping this site updated. Quick update first, I’ve still got lots of work to do — essentially trying to juggle doing my old job while learning to do my new one. It’s a little bit mental. I did get away at the weekend, but only for work. I was at a job fair in Cebu, interviewing (and recruiting as it turns out) various candidates. Hopefully I’ll have time to do a post about that, the fair itself was fun but the biggest revelation is what this country is like outside Manila. It’s the first time I’ve noticed that I must be only an hour or so away from what is basically a tropical paradise. Anyroads, more on that in another post — there’s some new photos up on my flickr site. Click through and pull up the large size, you should be able to read the text to see what surrounds me. It’s a weird little place, probably no more than a few km square but crammed with offices, apartments, shops and restaurants. Outside the area everything is notably more crumbling and dingy (and smelly), but inside it’s all polished and there are private police keeping things (mostly traffic) in check. I even saw a couple of shotgun carrying guards outside McDonalds a few days ago. I quite like living here, my apartment (in Olympic Heights on the map) is a few minutes from the office (1800 building) and no more than five minutes from anywhere in Eastwood. 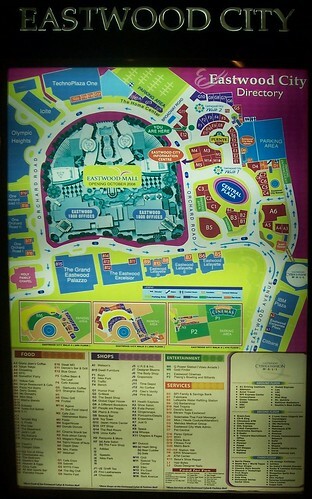 Everything you need is here, food, cinemas, bowling, gyms, banks, shops, laundry, even a barbers shop. There’s three separate 24hr corner shops, they don’t carry that much stuff but there is a huge supermarket another five minutes walk down the main road. The downside is tons of junk food, McDonalds, KFC, Pizza Hut, they’re all here and most are open 24 hours. Plus plenty of local variants and various restaurants and take-aways. None of it seems that healthy. Still, I’ll just have to slowly work my way round the various places and see what’s good (feel free to pick one at random and suggest I try it). There’s even a second McDs opening in the Eastwood Mall — just in case five minutes was too long a walk to get your Big Mac. Hmm, this post is almost as dull as a what-I-had-for-breakfast post (Honey Crunch Corn Flakes), but hopefully the map gives some impression of what the place is like. I’ll try and get some more photos of Eastwood and stick them on Flickr. I’ve still not ventured far outside Eastwood on foot, I’m not sure there’s that much in walking distance but I do plan go for a bit of an extended walkabout to see the lie of the land. I imagined that, living in Manila with few distractions, I’d have plenty of free time to catch up with various tasks, post multiple interesting updates and generally explore the area. But I find myself sitting on the couch, with a beer, again. There’s no crushing boredom to inspire me to action, I have to be sensible in order to get into work at a sensible time and I’ve hurt my foot which is curtailing too much mooching around the area. It’s completely different to my normal travelling where I feel compelled to do stuff whenever I can, since I know I’ll have plenty of time to do all that there’s no real urgency. I don’t mind this at all, it’s quite nice, I know I’ll get round to things sooner or later and it gives me time to relax. Which I need since each week seems to end with my employers deciding that I’ll be responsible for an extra aspect of work on the site, swelling my workload in an alarming manner from what I originally applied for only a few months ago. Interestingly they tend to drop this bombshell when we’re in the pub after work. Sorry this is a bit of a dull update, I will have to make a special effort to go find some stuff to take photos of and write about, otherwise people will begin to suspect that I’m not really in Manila at all. You are currently browsing the UnorthodoxY weblog archives for March, 2009.